Good evening! Got some fresh data today to spark a bit of volatility in the markets. We saw plenty of great reactions to my usual inflection points in the majors, but the best setup of the day in my opinion goes to a reversal signal in EUR/USD. For those who are not familiar with my framework, signals, or setups, please visit my discretionary day trading blog here. 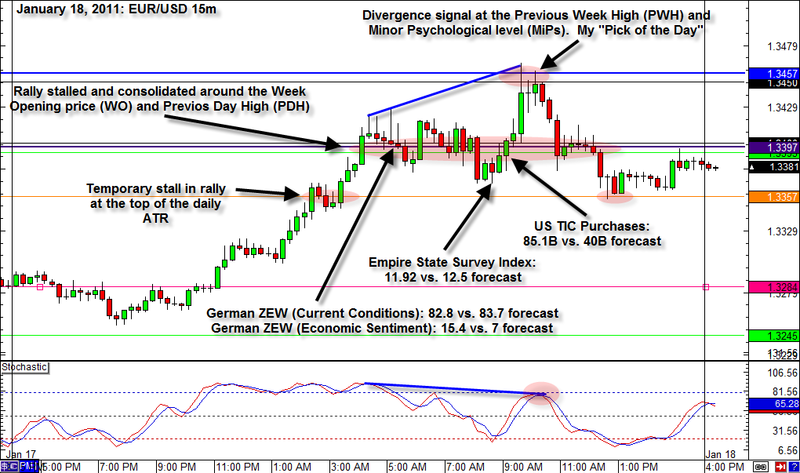 Fundamentally, there was a lot going on the Forex calendar for EUR/USD today as we got mixed German ZEW data, weaker-than-expected Empire State Survey Index, and a big positive TIC surprise. As we can see, EUR/USD rallied after the TIC data was release showing us the “risk on” trade on positive data is still in play. Technically, we can see the market rallied strongly from the Day Opening (DO) price at 1.3284 all the way to the cluster of inflection levels (Week Open price, Major Psych (MaPs) level 1.34, and the previous day high (PDH)). It wasn’t until we saw that great TIC data that the market rallied higher and signaled probably my favorite reversal setup: a divergence in price and stochs at a cluster of inflection points. Price made higher “highs” while Stochs made lower “highs” to signal a potential reversal at a weekly level and minor psych level. The market did stall at the PWH/MiPs and reversed lower where it stalled at the cluster of inflection points mentioned earlier and then found a bottom at the broken top of the daily ATR (20). That move from the PWH to top DATR was about 100 pips. Since this is my first review on this framework, I’ll go through a COMPLETE example of how I manage trades and the best possible trade execution scenario to stay in the 100 pip move and maximize your return. I emphasize BEST POSSIBLE because there’s a range of issues that can affect how we execute even the best laid out plans. (ie. we won’t always catch the best entry/exit points, our fears may take us out of the trade prematurely, trading platform user error, etc.). Again…BEST SCENARIO POSSIBLE. Before we enter orders, we have to figure a few things out, most importantly our risk. Let’s say you saw the signal and decided to enter short at the minor psych level 1.3450. To keep it simple, let’s also assume you decided to risk no more than 1% of your $400 account, which you calculated that risk to be $4. Finally, I like to use one third to one fourth of the daily Average True Range or a significant support/resistance level as my stop. But to keep this example simple, we’ll say 40 pips. To maximize a trade’s reward potential, I like to use an age old trade management technique describe in our lesson: Adding to Winning Positions. (Disclaimer: Before ever trying this technique, read the lesson, know the rules and practice it in demo many, many, many times before ever trying it live). When used correctly and safely, adding to winning positions can boost profits exponentially. When used incorrectly, or by someone who won’t adhere to proper risk management or stops, it can blow out an account in one trade. So, think of adding more to your positions as a loaded gun and handle with extreme care. You’ve been thoroughly warned. Alright, let’s move on to the trade and zoom into the chart. Step 1: You entered short in 1,000 units of EUR/USD @ 1.3450 (Please visit our Position Sizing lesson to see how I got “1,000 units”). Regardless of the position size, I like to call this initial position “Unit 1.” Your stop is 40 pips at 1.3490 and you trail it by 40 pips. So, your initial risk is -$4, or 1% of your account. Step 2: The market moves lower and you add another unit (1,000 units) at 1.3410. You immediately adjust your total position stop to 1.3450. This means that your first and second units are closed at 1.3450 if the market moves back up there. Your new position risk is still -$4 (Unit 1 would be closed at breakeven and Unit 2 would lose -$4 if stop was triggered @ 1.3450). Step 3: The market continues to drop, even after stalling at the infection cluster (WO, PDH, and MaPs), and triggers your third Unit short @ 1.3370. You adjust your total stop to 1.3410. This changes your position risk to $0 if the market rises and you exit at your adjusted stop of 1.3410. Cool, huh? 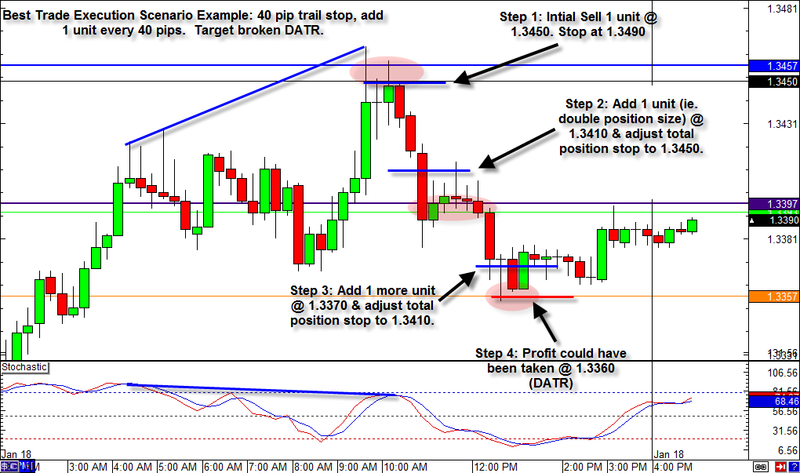 Step 4: Again, best trade execution scenario, but you decided to close out the entire position at 1.3360 because you thought the DATR would turn into support–which it did. Knowing that the price per pip with 1 microlot of EUR/USD is $0.10/pip, let’s see how the profit picture looks now that you closed it all at 1.3360. That is a total of $15 gain on $4 of risk, or a 3.75:1 reward-to-risk ratio. That’s a great return on risk, and all-in-all, a very good trade with risk managed well every step of the way. Will all trades work out this way? No way Jose! In fact, you’ll probably have more losing trades than winners, but if your winning trades have a reward-to-ratio of 3:1 or higher, you can lose 70% of your trades and still be profitable. It’s a weird concept for many to accept but it can work for some. So, there you have it–a complete example of my approach to discretionary day trading, but it is just one example. Inflection levels and their influence change every day, news events can surprise, market reactions are almost always unpredictable, and so on. The variables are endless and everyday is different, but that’s the challenge and that’s why I enjoy it–even the losing days. I hope this helps you see how price action behaved against today’s news and potential inflection points, and hopefully you can look to tomorrow’s session with this framework to find high probability trade setups with high reward-to-risk potential. Thanks for checking out my review and stay tuned for more. Sign up above for our Twitter, Facebook, or my email updates to be notified of my “Pick of the Day” right away! Good luck and good trading!